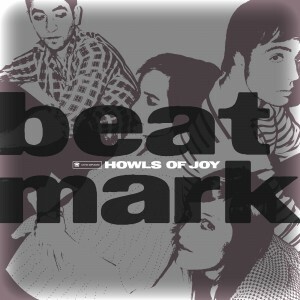 Parisian foursome Beat Mark released long-player Howls of Joy back in February with the quartet's fuzzy tones delighting a large portion of the online community. Originally founded by Julien Perez and Gaëtan Didelot, it is drummer Chloe Labaye who took time out to speak about some of her favourite record stores and the perpetual wisdom of Tom Waits. The G-Man: What is your favourite record store, where is it located and why does it hold a special place in your heart? Chloe: The one I know best and feel good going to is Total Heaven, in Bordeaux. I met Martial, one of the current runners of the place when I was 18, I was waiting for a bus to go to the Benicassim festival in Spain, which my friend and I eventually found out we could not get on, so we jumped into a train, which ended up being 3 trains. That was the year a huge storm caused stage lights to almost fall and kill the band Urusei Yatsura, the guitar player came close to being crushed on stage. Martial was there and absolutely thrilled at the way everything turned out. Total Heaven is cool. There was another record store called Black et Noir in Bordeaux but it closed when I was 19. The guy owning the place spent his time reading novels behind the counter and never spoke a word unless you picked up a record he liked. Hanging out at those record stores was what made me steal my dad's old record player and buy vinyls. It was very frustrating to have to manipulate ridiculous tiny plastic CDs while those gorgeous black wax things that you couldn't touch in the wrong manner just waited to be unwrapped from their sleeves. In January HMV closed its doors in Ireland yet independent record stores such as Plugd Records (Cork) and Tower (Dublin) live on. What role do you feel local independent record stores play in the community as opposed to large chains? Precious advice, friendly feeling. You meet people there, you hang out, you rummage around, you feel at home. Small independent record stores is probably where music is still considered as vital as breathing. What is the first record you have ever bought? The first vinyl I remember asking my parents was for Christmas and was the Violator LP by Depeche Mode. I didn't have any CD player at the time, just a record player for kids. I still have that LP. Do you visit record stores when away from home? When travelling, Julien [Perez - co-founder of Beat Mark] and I like organising their days according to the various record stores they can visit. Bookstores, museums and galleries, record stores: The best ways to get to know a city, at least our western ones. They always lead you to the coolest neighbourhoods. 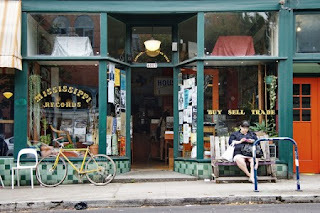 One very nice place is the Mississippi Records store in Portland, Oregon. They had one big leather armchair for you to sit in and a record player right next to the shop window. You could just sit and stare at the street and its people while listening to tonnes of records and the owner would never cease smiling and chatting around and never get annoyed. Also, Amoeba San Francisco (neither of us ever went to the LA one) is that sort of huge warehouse you can never leave on time. You get there at 3pm and it's dark outside when you get out, and you’re late to meet the person you were supposed to meet one hour prior. Being as truthful as you possibly can, what record is your guiltiest pleasure? 'Sowing the Seeds of Love' by Tears for Fears. Muahaha!! What would you say to a young music lover who has never visited a record store before? Describe your last record shopping trip? Last weekend I went to Pop Culture in Paris to bring the owner, Fred, a few Beat Mark tapes and 7 inches. I wanted to get the WITCH Introduction reissue and almost bought The Cleaners From Venus one, that is until I realised I was broke. So I just stared at record sleeves instead. I listened to a Hawkwind record, but not the one with Lemmy. Describe what it felt like the first time you saw one of your releases in a record store. Tom Waits has said "Folks who work here are professors. Don't replace all the knowers with guessers: keep 'em open, they're the ears of the town." The man is right. Tom Waits = badass. If you owned a record store, what would you name it? Why would you be an amazing/terrible record store owner? I really have a hard time putting CDs back into their boxes. The place would be a hell of a mess.